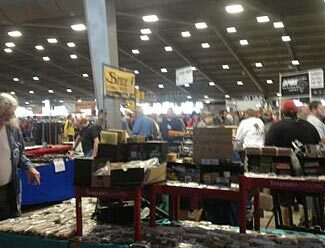 Gun stores and gun shows are all reporting massive increases in business. Black Friday this year set a new record for gun sales nationwide, which were up 20% on Black Friday last year. Gun sales can be loosely tracked to the number of calls to the FBI’s NICS background check service. Any time a person buys a firearm from a registered gun dealer, the dealer needs to call the NICS service for an instant background check and obtain an approval code for the transaction. Of course, not all sales are from registered dealers (private party sales are excluded) but probably all new gun sales necessarily go through dealers, and so the NICS call volume gives us a way of understanding the number of new guns being purchased and added to the country’s overall supply of guns in private hands. One call to NICS can sometimes be for multiple guns being sold at the one time, so from that perspective, sometimes the count of guns sold could actually be higher than the NICS call number. On the other hand, some states also call NICS to validate CCW licenses, and so these other calls to NICS, for purposes other than people buying new/additional guns, tends to mean that the total guns sold are less than the number of NICS calls. However you adjust the raw NICS numbers, there remains the simple fact that, in general terms, the higher the number of calls to NICS, the greater the number of new guns sales that are being conducted, and this is particularly true on days when state and local authorities are probably closed and not calling NICS for other purposes (ie, Saturdays, Sundays, and public holidays, such as probably is the case in most areas for Black Friday, the day after Thanksgiving). In 2012, Black Friday saw 154,873 calls in to NICS, a 20% increase on the 129,166 calls for last year’s Black Friday. Call volumes were so high that the FBI computer system overloaded and crashed on two separate occasions. Every month for the last year has seen more NICS calls than for the same month the previous year, and every year for the last ten years has seen more NICS calls for the full year than the previous year. Here’s the FBI official statistics on a monthly basis for every month since the NICS system started in November 1998. Now that President Obama has gone on record, in the Presidential debates, as saying he advocates a re-introduction of an assault weapons ban, and with the renewed threat of a UN weapons treaty abridging our second amendment rights as well, we agree with the flood of people racing to buy firearms that there is good reason to be concerned with the status of our second amendment rights. As some people have wryly pointed out, Obama has been the ‘best friend’ the gun industry has ever had. His presidency has seen an unparalleled growth in new gun sales, which seems destined to continue into the future. Oh – don’t forget stocking up on ammo, too. Continued attempts to tax every bullet sold, and/or to outlaw lead in bullets, show that the gun-banners are exploring every possible way of diminishing your rights to affordably own and use firearms.